If you're looking to add a dash of tech class to your well appointed kitchenette, look no further than the GROHE FootControl Tap.This beautiful and high-tech tap dispenses water with a simple push of a pedal, no hands needed. It's the ultimate in water-dispensing elegance. It's Farrah Faucet! • Head to our Facebook compo section for your chance to win a GROHE FootControl Tap! GROHE's new FootControl technology has been developed for those who always have their hands full when cooking and doing kitchen chores. It lets you control the flow of water without any hands or arm contact, providing you with more flexibility in the kitchen. This state of the art tap is activated by tapping the bottom of the kitchen unit, so your tap stays clean and hygienic, as you no longer touch the tap with dirty fingers. As well as fewer germs on the taps from your hands, FootControl also helps to prevent cross contamination between different types of food, further improving hygiene levels within the kitchen. 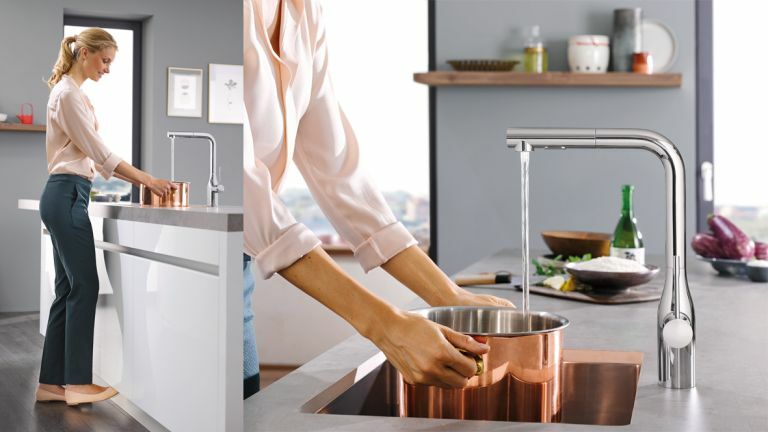 GROHE is delighted to be able to offer one lucky T3 reader the chance to enhance their kitchen with a brand new FootControl kitchen tap worth £1,130. • Please note: installation is not included, and for the tap to work properly, your water pressure must be higher than one bar.